This is a guest post by Jeff Ploughman, a Security Architect at T. Rowe Price and founder of the DC-Baltimore HashiCorp User Group — this work was done in his role as an Ethereum aficionado and open source contributor. Ethereum, like many blockchain-based ecosystems, is fundamentally a decentralized technology. The protocol was designed to place little to no trust in 3rd parties like cloud providers, certificate authorities, or DNS. The blockchain that underlies Ethereum is replicated on every node in the network so that the loss of any particular node (or subset of nodes) is not impactful. The fundamental innovation of blockchain is how distributed consensus is achieved without trust. And while there are endless debates about the efficiency costs of this trustless model or the overall utility of blockchain, I am more interested in the practical ramifications of this decentralized architecture. The foundation of all blockchain ecosystems—the "crypto" in the currency—is the system known as public key cryptography. And while the public portion of a key pair may be disseminated in a decentralized manner, the private key is a fundamentally centralized concept. This fact has caused a bit of an impedance mismatch: it often feels like the centralized nature of private keys is an afterthought in the design of many blockchain systems—including Ethereum. Wallets often feel like awkward sidecars to the protocol; and, the security and usability of private key management tools for Ethereum (and blockchains in general) are often lacking. This is especially true within an enterprise: try to imagine a large company using a laptop for the keys to all its accounts. Private key management is the first problem that any blockchain consumer needs to solve. Vault can help. Vault's raison d'être is to solve the secrets management problem. And since Vault can scale from a single laptop to a highly available, globally replicated data center, it can be used as a personal wallet or as an enabler of enterprise blockchain use. Vault's design allows it to broker many forms of authentication with many forms of credentialing. As a consequence of using Vault as a platform for an Ethereum Wallet, I was able to trivially add MFA support - making Vault the first standalone Ethereum Wallet with MFA. Another benefit of using Vault as a platform for an Ethereum Wallet is that we get all the benefits of a hierarchical deterministic wallet without the risk - with this Vault plugin, I can very quickly and easily create many Ethereum accounts based on independently derived private keys. The Vault Ethereum plugin is an implementation of a secret backend. This plugin provides many of the capabilities of an Ethereum wallet. It supports public and private chains. It can support smart contract continuous development practices by providing mechanisms to deploy smart contracts. It enables you to sign and verify signatures on arbitrary data. And, of course, you can send ETH. Some of the functionality (creating accounts, signing and verifying) can happen without needing access to an Ethereum Node. Other functionality (deploying contracts and sending transactions) will require access to the Ethereum RPC interface. When you enable TLS, authentication to Vault is secure and no credentials or key material are leaked when signing transactions. This means that Vault can live on a different machine than your laptop— something you typically can't do with RPC-based wallets. You have already installed Vault and you are using TLS for transport security. This means you are not using Vault in dev mode. You have an Ethereum RPC endpoint that you can communicate with. For this exercise, I will be using a Geth node at http://localhost:8545 running on a private chain. You can use any RPC endpoint (including the secure, trusted and centralized endpoint at Infura). If these assumptions prove problematic, you can use these instructions to create a Vault and Ethereum playground. First, lets download and verify the authenticity of the plugin. Note: I use Keybase PGP to sign my releases. echo "Plugin Validation Failed: Signature doesn't verify!" Signature verified. Signed by immutability 15 hours ago (2018-02-20 17:23:15 -0500 EST). Note the configuration for api_addr. This setting is critical for the plugin to communicate with the Vault server during mount time. Now our plugin is installed and enabled. We configured the plugin as an administrative user. To properly demonstrate the power of Vault to manage access to the Ethereum backend, we will first create a non-administrative user who is not allowed to do any plugin management. While we are still acting as an administrator, we will enable the Userpass Authentication Backend, configure it for MFA using Duo's free service, create a user named muchwow and, finally, attach this user to a policy that allows them access to the Ethereum backend. We also establish a fairly short TTL for this user— they will have to renew their session token before 10 minutes are up or they will have to re-authenticate. Care should always be taken when using passphrases. One of the benefits of Vault is that it provides many forms of authentication which means that you can avoid the awkwardness of handling certain kinds of passphrases. Lastly, we configure MFA. I won't go over registration or device enrollment flows here. 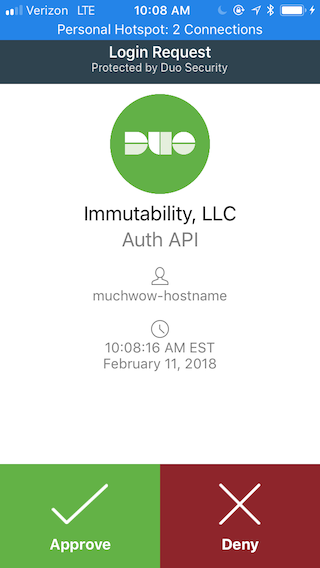 I am using Duo's service for MFA which is currently the only one supported in the OSS version of Vault. Configuring MFA requires you to get an API key from Duo. Error authenticating: Error making API request. Of course, even though we have MFA enabled on our account, we change our password for sanity's sake. drwxr-xr-x  5 immutability  admin  170 Dec  2 11:57 .
drwxr-xr-x  3 immutability  admin  102 Dec  2 11:55 .. The complete API to the Ethereum plugin is documented here. Each API is exemplified using curl as a sample REST client. Lastly, we want to demonstrate how easy it is to backup our Ethereum Wallet. If we want to move a personal wallet onto another machine or put it into offline storage, it is a very simple exercise. Before we take our wallet offline, we need to spend a moment talking about the Vault seal. We haven't discussed Vault's most fundamental security mechanism: the sealing process using Shamir secret sharding. When Vault is initialized, a set of Shamir key shards are generated. These key shards are used to build a master encryption key which is used to encrypt all data in Vault. If you so desire, you can leverage Keybase PGP to create what amounts to a multisig mechanism to protect Vault: a quorum of key shard holders is necessary to unseal Vault— where each shard encrypted with a different PGP key. It should go without saying that these unseal keys should be stored securely. Assuming that your unseal keys are safe and sound, putting a wallet into cold storage can be accomplished by simply killing the Vault process and moving the Vault data and configuration to a flash drive or other mount. Restoring from cold storage is the opposite process with the additional step of unsealing the Vault. The Ethereum plugin has more capabilities than we showed here. It supports whitelisting and blacklisting accounts, smart contract deployment and the signing and verification of arbitrary data. In this exercise, we were able to use Vault to build a MFA-enabled Ethereum Wallet. We did this with the simplest Vault authentication method, the userpass backend, but it is easy to see how we could leverage other authentication mechanisms: e.g., a CI/CD pipeline for smart contracts might use GitHub authentication (with MFA) to allow slaves to deploy Solidity code. This exercise demonstrated using Vault as a personal wallet; however, the same basic techniques can be used for an enterprise. 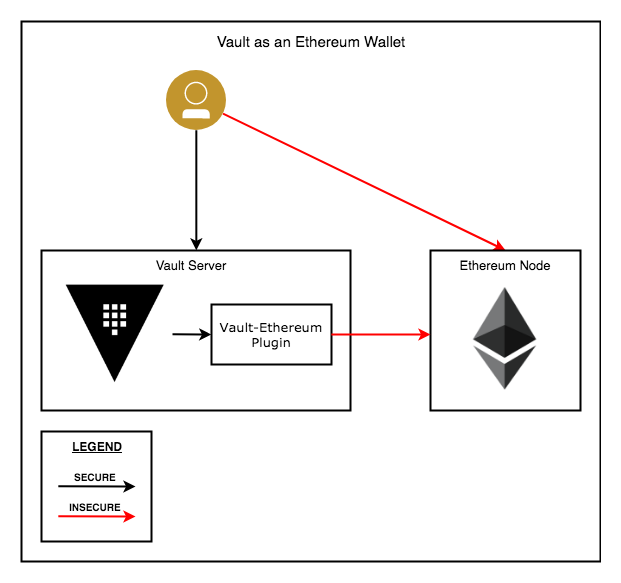 However, if you want to solve the Ethereum wallet use case for an enterprise, Vault Enterprise provides an even more compelling platform. In addition to Vault Enterprise's advanced replication and HA mechanisms, Vault Enterprise supports HSMs as a persistence mechanism for Vault keys. This makes Vault equivalent to what is called a hardware wallet. (Vault Enterprise with HSM support is very comparable to what Gemalto and Ledger have developed.) Lastly, while the Ethereum plugin does support whitelisting and blacklisting— capabilities that are essential for anti-money laundering compliance— Enterprise Vault additionally provides a sophisticated rules engine called Sentinel for more robust compliance support. Vault, with its plugin architecture, is a platform for building advanced secrets management solutions. As such, it can become an enabler for enterprise adoption of blockchain.